*Please note there is a $2 a day discount for multiple dogs boarded together and for visits that last more than 21 days. Special care such as medication, special feeding, puppies and geriatric care is an additional charge of $2 per calendar day. Private playtime (one-on-one) sessions are also available. They are 30 minutes and are $15. Please note that this applies to all un-neutered and all un-spayed dogs and any dog that does not get along well with others (at Alcala Country Pet Resort’s discretion). 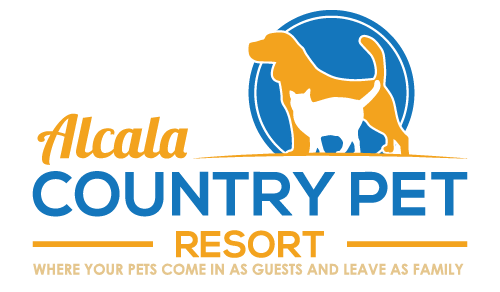 Alcala Country Pet Resort charges by calendar day. We do this to ensure that every dog goes home happy and healthy and that the owners are not rushed. This means that there are no predetermined check in and check out times. We do ask that you pick up your dog after noon if your dog is getting bathed. We do realize that this can be confusing at first so please ask for an estimate if you would like one. Every dog boarding at Alcala Country Pet Resort is bathed on the day the dog is going home unless otherwise specified by the owners. Typically, a bath is only $15 ($20 for large dogs) unless your dog is very thick coated or matted. Other grooming services such as nail clippings and ear cleanings are available upon request.